EA Sports Cup Final Man of the Match Jamie McDonagh of Derry City, says he hopes to remain at Derry City should nothing materialise from interest from English clubs. The N Ireland U21 international has confirmed that he has held talks with the Brandywell club but concedes the lure of cross channel football could be too good to turn down. Nevertheless the Lisburn man also stated that while he has offers from other clubs in Ireland his preferred option would be to remain at Foyleside and hopes to have talks with new Derry City boss Declan Devine in the coming days. 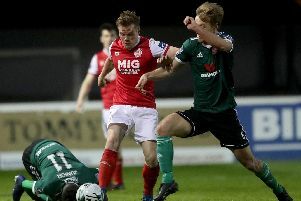 The 22-year-old, who had a scathing attack on his Derry team-mates towards to the season where he felt that some players weren’t p****d off enough when they weren’t in the team, has believed to attracted interest from Irish League and League of Ireland clubs. “I have a few offers from England and like everyone I want to play at the highest level. However those offers are not concrete, so I’m going to wait and see,” he stated. “I’m in talks with a few clubs, but Derry City know exactly where I’m at, but if I stay in Ireland then my first option would be to stay at Derry. “I spoke with Sean Barrett (Derry City Chief Executive) a few times and I have told him that I want to speak to the new manager, before making a final decision. I want to see what the new manager’s ambitions and what type of players he’s looking to sign, but I want my future sorted by the end of the month, as I go away on holidays then. With the likes of big spending Larne and Cork City believed to be two of the clubs tracking McDonagh, the ex-Sligo Rovers man wants to stay with Derry. “Sean knows what I feel about Derry and to be honest it’s just a case of the new manager speaking to me and I’m sure it will be sorted by then,” he added. “I’m more confident that I’ll be back in Derry next year then anywhere else. As I said there might be one or two things happening in England at the minute and I’m holding out to see if anything comes from that over the next couple of weeks.“If anything does happen with a team in England then obviously I would have to take a serious look at it, because I want to play at the highest level possible and if any of those deals are concrete then I obviously would like to play in England, but it’s just a waiting game at the minute.